The stylish fashion lanyard straps are great for making double ends lanyards. You can order any length of lanyards with two ends, with same style of hardware at each end, or you can pick different style of hardware at each ends. A variety of standard lanyard or cell phone hardware attachments or Deluxe Ez-Adjustable hardware attachments are available for your different applications. We will make the custom length and custom combination of hardware attachments for you and ship your custom order right away ! 10. Minimum Order: 1 Pieces/Per Color, Per Style. 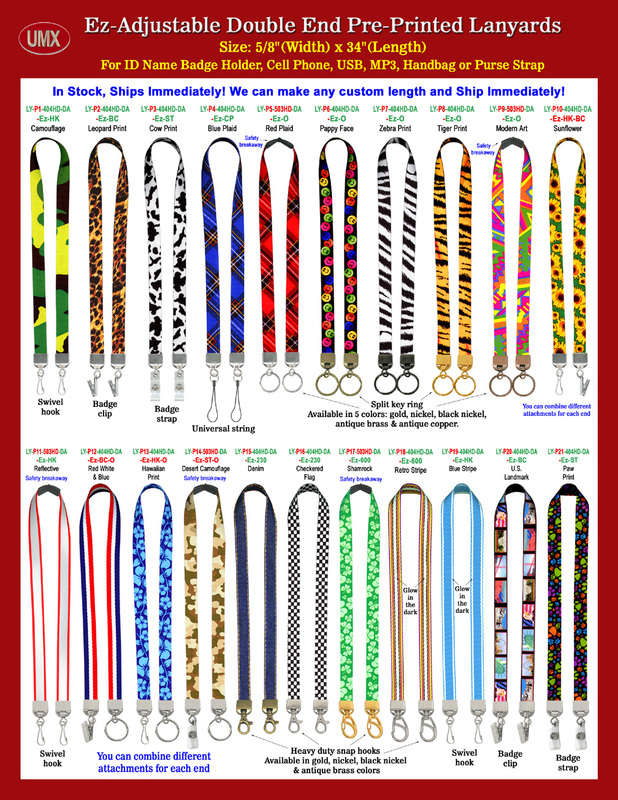 You are viewing Lanyards > Ez-Adjustable Neck Wear Models > Imprinted Double-End Lanyard With Easy Adjustable Length.